Introduction Aneurysmal subarachnoid hemorrhage (SAH) has a poor outcome, particularly attributed to progressive injury after the initial incident. Several studies suggest a critical role for inflammation in lesion progression after SAH. In contrast to previously published findings in experimental ischemic stroke models, interferon-b has no clear efficacy to protect the brain after SAH as has been demonstrated by a group of scientists from the University Medical Center Utrecht, which do not recommend clinical testing of interferon-b to prevent neurological damage in SAH patients. Aneurysmal subarachnoid hemorrhage (SAH) has an incidence of 6–7 per 100,000 and carries a poor outcome: average case fatality is about 50 % and survivors frequently remain dependent. Delayed cerebral ischaemia (DCI) develops in the first days to weeks after the initial bleeding and is the most important cause of poor outcome in SAH patients who survive the first 24 h . Advanced brain injury after SAH has been recognized to be associated with early brain injury during the first few days as well as subsequent DCI. An increasing amount of data suggests that cerebral inflammation is a major factor in advanced brain injury after SAH, which leads to an increase in plasma and cerebral spinal fluid (CSF) levels of cytokines, cell adhesion molecules and leukocytes, which has been correlated with early brain injury, DCI and subsequent poor outcome. Hence, several treatment strategies against advanced brain injury have been aimed at suppressing the inflammatory response after SAH. A potential candidate for anti-inflammatory treatment is the cytokine interferon-β which has demonstrated beneficial effects in animal models of ischaemic stroke. 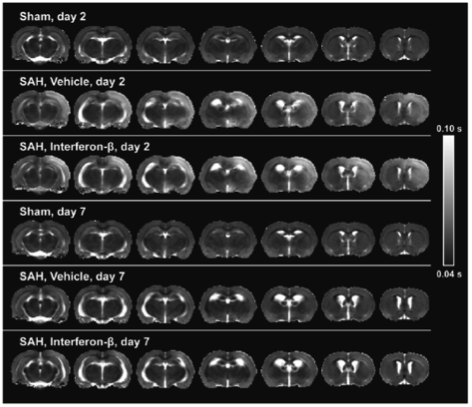 This is why van den Bergh et col. hypothesized that interferon-b treatment after SAH would inhibit the inflammatory response, reduce cerebral damage and improve neurological outcome, measuring the development of cerebral inflammation, brain injury, and behavioral status after experimental SAH in rats treated with interferon-β or vehicle. 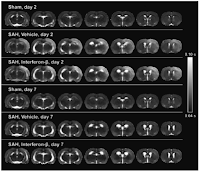 After several experiments designed to test the hypothesis in a model that most closely resembles clinical aneurysmal SAH, they found no indication that treatment with interferon-β reduces brain lesion formation, improves neurological outcome, or increases survival rate through chronic reduction of cerebral inflammation after experimental SAH in rats. W. van den Bergh et col. show once more how a negative result is an important finding with regards to recent emphasis on eliminating publication bias, in this case in preclinical stroke treatment studies.